There had been several attempts to dismantle National Monuments by big oil for years. But alas, someone put pen to paper. A recent conversion about GMOs came through from a piece of fiction. Since food affects everyone and we don’t produce our own food any more. The last part meaning you may have a garden or fruit trees, but the ability to raise cow, chickens, and pork isn’t allowed in every community. GMO is abbreviation for Genetic Modified Organism. Us humans have been playing with our food for thousands of years. For instance, in 1400’s corn had kernels on the top of the plant, not ears covered with them. Today, bt (Bacillus thuringiensis) corn actually has genetic coding from bacteria included in its own DNA. Thus modifying its genetics. While selective breeding has created thousands of varieties over decades, the process of genetic splicing produces much faster results. Crop production is the added benefit through either faster production, resistance to pests, and/or resistance to herbicides. The ‘traditional’ of pest control methods included things like applying sprays of Bacillus thuringiensis (bt). The bacteria is light sensitive did sunlight would break down the applications of bacteria fairly quickly. Which means lots of reapplying. And high costs to purchase more and more product. But why use it, the bacteria has a chemical toxic to pests and only dissolves in alakine digestive systems. Hey, ours are highly acidic! Therefore extremely safe for humans, birds, cows and pigs. Don’t mistake the Bacillus thuringiensis for the bt Corn. There are differences in what they are and why. The corn plant has the bt genes in its stalk, leaves, silks, ears, and roots. So Mr Bug eats at any part and ingests the toxin. Goodbye, Mr Bug. So far, so good. The bacteria has an outer shell between the toxin and the bug. The digestive juices eats away the shell. We don’t digest the shell, so we don’t ingest the toxin. There have been several studies to investigate the level of scariness that bt Corn should cause. Obviously, producers of bt Corn have financed a few of these and they say there are no side effects to humans. Also tip of the environmental hat, it requires less pesticides! There are many environmental groups that paid for studies that show bt Corn as franken-corn, ready to storm the world corn village destroying it all. The truth is probably closer to the middle. The bt Corn is usually resistant to herbicides like Glyphosphate (Commercially known as Round-up). Farmers tend to cultivate (weed) their fields by spraying Glyphosphate. The herbicide is water soluble and binds to proteins (animal and plant proteins). This is where things get cloudy. If consumed Glyphosphate can be found in stomach linings, esophagus, and intestines due to its ability to bind to proteins. It doesn’t flush out of the digestive system quickly because of the acidic environment. The catch is his much is in that ear of corn. Noone really knows. Why, each variety has different water content and kernels vary between feed (dry) and sweet corn. Corn meal can be made from either, but feed corn is mostly for animals we eat. There are few studies that compare corn with number of applications of Glyphosphate and concentration of Glyphosphate in the harvested bt Corn. There are fewer that analyse the concentration of Glyphosphate within beef, poultry and pork that ate bt Corn. But the reason here is fed corn isn’t labeled GMO sourced, how does a research know without analysing all the feed. These animals eat well… like pigs. You couldn’t do anything but spot check. Mist peole aren’t crazy because of variance your numbers would be questionable. It still could be done with multiple studies, each either verifying or disproving the original study. Again few studies are done and released but most are subsidized by manufacturer of Glyphosphate. In 2016, 90-95% of corn sold in US was classified as bt Corn. I sourced the websites and all had different numbers these represent the range of all three. Some websites state it is not appropriate to share their data (so they all anonymous). I have read a dozen articles and they are divergent at best in their findings. Personally, i make the decision to rely on chemistry and moderation with a heavy infusion of Farmers markets. If it is toxic to a bacteria or plant, than in sufficient quantities it becomes toxic to my cells. If it is binding to my cells, than it can alter my cells in sufficient quantities. What the hell is that about? Cancer is irregular cell division and toxins tend to interfere with cell division. Not everyone will die of cancer because of Glyphosphate. But several courts have awarded damages from its use. Reducing exposure to Glyphosphate is healthier for you. If you don’t know your food source then consider organic. Organic is NO guarantee to be free if GMOs, it means less chemicals exposed to the plants that produce your food. Outside of Tucson is a place to see critters and plants of the desert up close. Much like the little kitty above, you can see what lives here. The place is spread out over 98 acres. It’s in a very hot place in the summer (I visited at 105 degrees). It’s a full day to see it all. They have an aquarium, a reptile & amphibians building, an art gallery, a cave with mineral gallery, two aviaries (one for hummingbirds), a dozen animal enclosures (like above Mountain Lion), cactus gardens, stingray touch pool, and 2 gift shops. Several hourly docent displays are spread out during the day. These include snake touching. Life cycles of the Saguaro cactus. 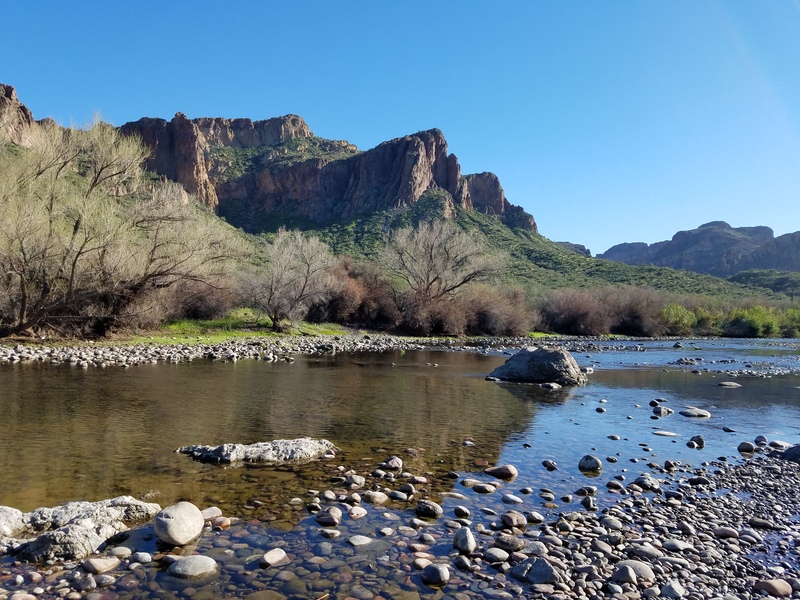 Life in the rivers and streams in Arizona. And they change daily. Well versed people are waiting to explain how the desert works. The landscape has been planted 55 years ago to represent as much of the Sonora desert that would predate human interference. While not all of these would grow here, they all live in the Sonora desert that covers from the Baja peninsula to New Mexico. Butterfly gardens include non native plants but the butterflies are wild feeding here. The animals are here by assignment. 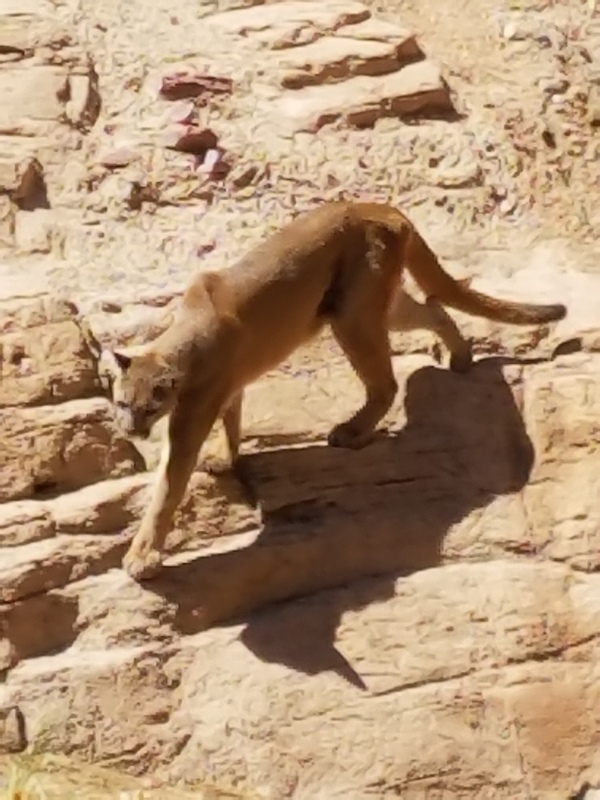 The Mountain Lion was orphaned. The pair of Mexican grey wolves are a retired breeding pair that was used to restore native range. The Black bear was raised by humans. They live in nice sized enclosures with AC and shade. The 19 stingrays enjoy a covered pool and for $3 you can touch them ($3 more you can feed them shrimp). I grew near a river that once burned a dozen times. I have seen orange horizons hours from sunrise or sunset. Places in woods and desert where trials were filed with debris. We have only one place to live for now. What view should the next generations have? In my distant past, I may have posted once or twice about GMO foods. I really try to avoid them. There is no research that says they are different under the microscope or to the naked eye. It’s the concept to why they are modified. The excuse is a moving target sometimes. At first it was to ward off pests, by the plant producing it’s own defenses. The Monarch Butterfly would thank them but it can’t where Bt corn is grown. Then it was to reduce the competition from weeds and the extra time it takes Mega farms to cultivate fields. Now we spray a protein binding general herbicide. The protein can be animal or vegetable and changes under the right conditions (digestion possibly). But what… we use the same herbicide to dry grains to quicken the time between harvest and sale! Let’s forget they interbreed with ‘normal’ varieties altering them to carry the modified genetic materials. Don’t worry the production is reduced in the real world. So why do we do this…..? I digress. According to Center for Food Safety, 92% of US corn has genetically-engineered origin, 94% soybeans and cotton are as well. Cottonseed oil is a cheap oil used in mass produced food. Transgenic wheat is a mystery. It doesn’t exist but traces are found in our food. Rice is 60 to 70% modified in our foods. Most of these many represent the grains as mixed as an ingredient not always whole grain.